This week we recognize the many contributions graduate and professional students make to research, teaching, and service at the University of North Carolina at Chapel Hill. We encourage all faculty, staff and students to come up with your own ideas and events focused on celebrating the contributions of graduate and professional students. These could be: a morning or afternoon coffee break, a lunch celebration, fun giveaways, photo opportunities, a social media campaign — feel free to think outside the box! Let us know about your efforts, and please promote the hashtag #UNCGradStudents on social media with a photo featuring Carolina graduate students. Happy Monday! While you’re at our table, pick up a button to show your support for graduate students at Carolina! We’ll have “Carolina Graduate Student” and “Carolina Loves Graduate Students” buttons for the taking — pick the one that suits you best! Undergraduate Student Government: Thank Your TA/RA! Undergraduate students: Come by our booth in the Pit and make thank you cards for your teaching assistants and research assistants! Undergraduate Student Government will provide the art supplies, you provide the name and department, and we’ll make sure your appreciation and gratitude get to your TA/RA’s box by the end of the week. Join the Racial Equity Institute, The Graduate School at UNC-Chapel Hill and the Weiss Urban Livability Fellows for a conversation on racial inequity in academia. It’s an opportunity to reflect on your own experiences to gain a greater understanding of the role of race in your research, work and relationships. Refreshments provided. Registration is required. Join Erez Zohar of Batsheva Dance Company for a Gaga/Naharan movement workshop hosted by Carolina Performing Arts. Gaga/Naharin is a movement language developed in the Batsheva Studios over the last decade by Ohad Naharin, Batsheva’s long-time artistic director. This movement language is used daily by dancers of the Batsheva Dance Company and Batsheva Ensemble as the basis for their distinctive technique. This workshop is open to people ages 16 and up. No previous dance experience necessary. Space is limited. First come, first served. RSVP via email and please state if you are a graduate student. Carolina Dining Services celebrates graduate and professional students with special treats in the common area outside the Beach Cafe. Stop by and see us on your way to and from class or lab! Part of being productive is knowing when to take a break! Come have coffee and cookies, do some crafts, and learn about graduate and professional student groups (like Stigma Free Carolina) and campus offices (including ARS, CAPS, Campus Recreation, Student Wellness, Writing Center, The Graduate School) that want to support your health, well-being, and success. Chat with Susanna Harris (PhDepression) and Ben Lee (Stigma Free Carolina) about specific efforts to support graduate student mental health at UNC-Chapel Hill and beyond. And take a bit of a breather in the middle of your day! The sublime result of six decades of innovation by Tel Aviv-based Batsheva’s founder Ohad Naharin, Venezuela combines his signature Gaga technique with Tango and rap in a collage of scenes showcasing dialogue between music and movement. Courtesy of Carolina Performing Arts, use code GRADFREE to redeem up to two complimentary tickets (while supplies last) online, by phone (919.843.3333), or in person at the CPA Box Office at Memorial Hall (M-F, 10 AM-5 PM). To redeem online: Select desired performance and click “Buy Now.” On next page, you must enter the code in the top right corner of the page before selecting number of tickets for the code to work properly. What can I do as a student to protect myself? How do I navigate spaces that can negatively impact me? The GPSF is bringing to you our next Lunch and Learn series: Student Rights. We will have a panel discussion from our campus partners to allow students to ask and learn about their rights here at UNC. Come out and hear from our University regarding your rights and the resources in place to support you, both academically and personally. Want to laugh your way into wellness? Research indicates that laughter therapy may decrease anxiety, stress, and depression and improve quality of life. Come and try out some laughter therapy techniques with your peers and giggle, guffaw, and laugh your way into wellness. Take a risk and be silly, and walk away feeling rejuvenated. GPSF & CUAB Outdoor Movie Night! Ready for a nostalgic movie night? The GPSF and CUAB are teaming up to bring you 1997’s “Good Burger”! Come on out to Baity Hill by the leasing office for an outside showing of our favorite ’90s movie. We will have movie snacks on hand for you to enjoy. Are you interested in exploring acupuncture? Campus Health is offering complimentary acupuncture treatment to the first 8 registrants (scheduled in 15-minute increments). To schedule your complimentary treatment, please call 919-966-2281 and connect with central appointments staff. Sorry, all appointments are booked. The Graduate Student Recognition Celebration celebrates the many ways graduate and professional students contribute to our University and beyond. Specifically, the event recognizes students who have received prestigious external fellowships and numerous other awards this academic year. The event begins with the awards ceremony at 4 p.m. and is followed by a reception with research poster presentations. All graduate and professional students are invited to attend! Life as graduate and professional students can be challenging. OK, let’s not kid ourselves. It *is* challenging. But who are the people that help you get through those difficult patches? Your parents who call you once a week? Your partner who makes you dinner? Your kids who give you hugs? Your advisor who thanks you for your contribution to a project? The friend in your cohort who drags you out for coffee when they know you’ve been staring at your screen for too long? Come out to the GSC and join Associate Dean Ngai in writing notes of gratitude. We’ll have note cards available (you bring your own pens!). And for this special event, she’ll even mail them for you! Join staff from Counseling and Psychological Services (CAPS) for an introduction to mindfulness and meditation workshop. The workshop will provide a brief overview of mindfulness and meditation along with facilitation of mindfulness and meditation skills. Mindfulness has been shown to help with stress management, anxiety, difficulty focusing, and overall emotional wellbeing. We hope you can join us as you ease into the weekend! As we wind down Graduate and Professional Student Appreciation Week, join The Graduate School staff for some sweet tea, lemonade, and cookies on our front porch. It’s nothing fancy, but it’s a little reminder of where you can go when you have questions, need help, or just want to get to know us a little bit better. We’re here for you – on this day, throughout your graduate school career, and beyond. Come join us for some southern hospitality – and hopefully sunshine! One of the foremost violinists of our time, Gil Shaham is a Grammy Award-winner and has been acclaimed for his appearances on the concert stage since the age of 10. He is joined by distinguished pianist and composer Akira Eguchi. Celebrate GPSAW all week with these special discounts for graduate and professional students! Make sure to show your UNC ID and mention the promotion at the register. To celebrate Graduate and Professional Student Appreciation Week, Carolina Performing Arts is offering a limited number of complimentary tickets to grad students at UNC-Chapel Hill! Use code GRADFREE to redeem up to two complimentary tickets for performances of Batsheva Dance Company: Venezuela on April 2 and Gil Shaham, violin & Akira Eguchi, piano on April 5 (while supplies last). E(I) Lab is celebrating graduate and professional students this week with free T-shirts in the lobby of Marsico Hall every day from 11 a.m. to noon! Stop by to pick one up and learn more about the work of E(I) lab to bring together graduate students, professional students and postdocs from diverse disciplines across UNC-Chapel Hill to develop innovative healthcare solutions. Our graduate students fuel Carolina’s excellence today and will power our world in the future. Some of the world’s greatest innovations begin in graduate programs and Carolina would not be the top-tier research university — and the most public of the publics — without the essential contributions of our graduate students. 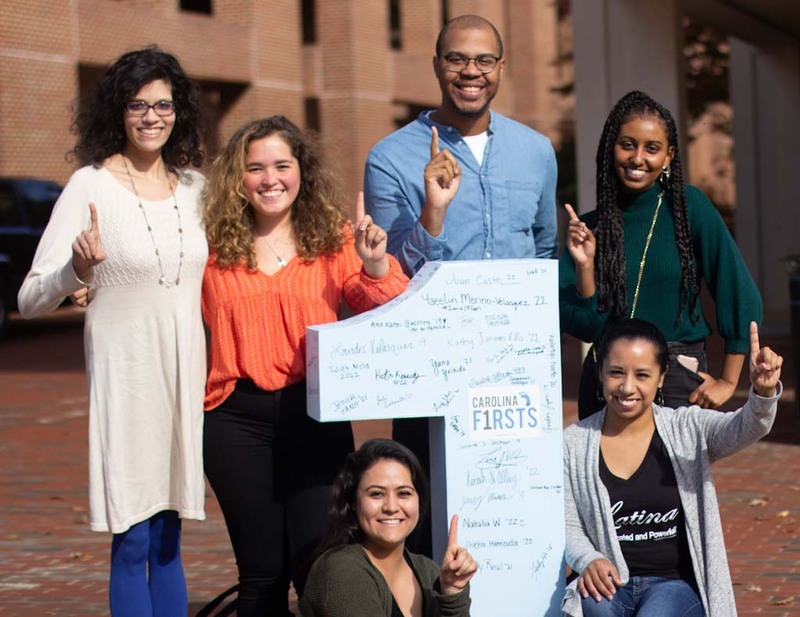 I love how much graduate students contribute to Carolina, from the diversity of their backgrounds and experiences, to their intellectual energy and enthusiasm, to their commitment to service and others. Let’s celebrate them always, and let’s celebrate them in particular during GPSAW! Please take a few moments to recognize all of the wonderful graduate students in your midst. I know they’ll appreciate the nod! Graduate students make contributions that are absolutely essential to the mission of UNC-Chapel Hill and to the quality of life in North Carolina. They produce new knowledge that benefits communities throughout our state, and they deeply value the relationships they build with people in these communities. They approach undergraduate teaching with enthusiasm and creativity. Even while pursuing their own academic goals, they take time to encourage community, student wellness and other important facets of life at Carolina. I wish our graduate students continued success — and I sincerely thank the many faculty and staff members who are dedicated to supporting graduate students at Carolina every day. 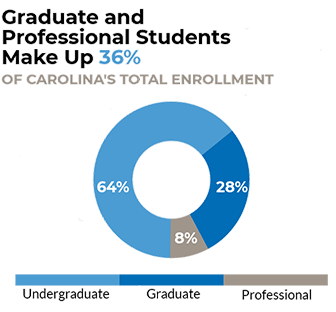 Our graduate students are one of North Carolina’s most valuable resources. Not only do they power UNC’s $1 billion research enterprise, they represent — across all disciplines — the highly skilled workforce our state must have to prosper. As the next generation of researchers, they represent our future. UNC has given me the incredible opportunity to expand on my undergraduate education in a very meaningful way. The Sport Administration program has allowed me to learn about the intricacies of intercollegiate athletics while participating as a student-athlete: a valuable experience and perspective that is enhanced by distinguished professors, hands on research, and a collaborative cohort. Through this opportunity, I know that Carolina loves graduate students. One of the great rewards that comes from serving on the UNC Graduate Education Advancement Board is meeting the talented graduate students who come from near and far to work with our distinguished faculty. They master research by doing it, teaching it and publishing it. In doing so, they expand our knowledge of the world and contribute to the well-being of our communities.